Forbes 2012 Valuations – They’re just making stuff up, aren’t they? STORY UPDATE – The situation regarding the Sacramento Kings has since changed. For more information on the Sacramento Kings request for a deadline extension, please go HERE. I was expecting to just sit back, relax, and enjoy a nice, long day of watching hockey today, but pretty much as soon as I woke up I noticed not one, but two relocation rumors circulating the web. When it comes to any sports relocation rumors, you need to obviously take them with a grain of salt. However, these are surrounding two teams that are oft-discussed as potential relocation candidates and the stories have been picked up by various major media outlets, including the New York Times, USA Today, and ESPN, so I think that the discussion of both teams is obviously worthwhile here on SportVotes. The first rumor is surrounding the Sacramento Kings of the National Basketball Association. According to ESPN reporter Marc Stein, and seemingly confirmed by NBA commissioner David Stern, the Kings are in close negotiations with the city of Anaheim over the possibility of moving from the state capital to the Orange County for next season. Any such relocation proposal would need to be submitted to the NBA by March 1st, so the Kings are really on the clock if they are actually considering this move. Purple basketballs are in vogue in Sacramento. For those that don’t know, the Kings are a team that have already relocated three times over the course of their long history, having existed previously as the Rochester Royals (1945–57), Cincinnati Royals (1957–72), and the Kansas City/Omaha Kings (1972–85) prior to finally moving to Sacramento. No matter where they go however, the franchise just never seems to be able to find sustainable success and are currently experiencing what will soon become a six-decade championship drought. In the quarter century they’ve spent in their current home, the Kings have appeared in the playoffs ten times (including an impressive eight-year streak from 1999-2006), but have only won their division twice. They’ve been stuck out of the playoffs for the past four seasons and have been suffering from declining attendance during that time. Couple that drop in attendance with the team’s belief that they play in an outdated facility, the ARCO Arena (set to be renamed to the Power Balance Pavillion on March 1st, oddly enough the exact same day as the already mentioned deadline to give notice to the NBA for a possible relocation for next season), and you have a classic recipe for relocation. The Kings have been pushing for years for the construction of a new, state-of-the-art arena in downtown Sacramento. They had planned on eliciting partial public support for the proposed-$600 million arena, but in 2006 voters overwhelmingly rejected a pair of ballot measures which would have created a 15-year quarter cent sales tax increase for the funding of the new arena. With this avenue for revenue blocked, the Kings and the NBA approached the California state fairgrounds with a plan that would include a potential landswap and various other measures to allow for a new facility to be built on their grounds. In 2010 though, this too was shot down, leaving the Kings with the firm belief that they had to consider the possibility of relocation. Ever since then, the Kings have been in highly publicized and speculative meetings with various municipalities, including Las Vegas, San Jose, and Louisville, Kentucky on the possibility of moving the team. On February 19th however, during the All-Star Game festivities in Los Angeles, the relocation discussions appeared to have gone from speculative to probable, as NBA commissioner David Stern admitted that the Kings were currently in discussion with the city of Anaheim and that the team had inquired the NBA about the potential to relocate. While the threat of moving a franchise has long been used as leverage to successfully gain public funding for new arena construction projects, these appear to be actual serious discussions. Couple that with the short timetable between when the discussions became publicized with the notice deadline for any potential relocation, which stands at just a little over a week from now, and from all perspectives this appears to be a serious threat over a mere bargaining ploy. If the discussions actually move to fruition, the Kings would likely play in the Honda Arena, home of the NHL’s Anaheim Ducks. An interesting name discussion might also arise if the relocation goes through, as the Los Angeles metropolitan area already has another franchised named the Kings, the Los Angeles-based NHL team, which plays a mere 30 miles to the northwest of their prospective home in Anaheim. While there have been past examples of teams in the same area having the same name (such as the former examples of the St. Louis football and baseball Cardinals and the New York football and baseball Giants), it would be a unique rarity in sports today. In fact, the Sacramento Kings also have a history of changing their name in acquiescence of another team, as the franchise became the Kings so as to not have the same name as the Kansas City Royals of the MLB when they relocated, despite the fact that the basketball team had existed in other cities long before baseball team had even been founded. But, that would be a discussion for another day. 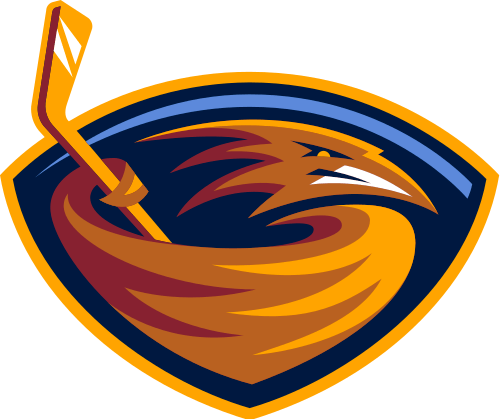 The next team that has been rumored recently is the long-troubled Atlanta Thrashers of the NHL. While the rumors circulating around the Kings appear to be at least relatively substantive, the rumors about the Thrashers are much more speculative, albeit still significant. The Thrashers have existed in Georgia since they were founded as an expansion franchise in 1999. Since their foundation though, the Thrashers have been a troubled franchise, having only made it into the playoffs once in their time in the league. Combined with attendance figures that have been near the bottom of the league for years with their very low franchise value, which has been ranked 121st out of 122 major professional sports teams in North American in both 2009 and 2010, and you can see why the Thrashers have long been rumored on the league’s chopping block for potential relocation. Despite their on- and off-ice troubles, I've always liked the Thrashers logo. Despite recent high profile moves by the team in adding to their roster to try to make it to the postseason this year, including signing assistant captain Dustin Byfuglien to a five-year, $26 million contract, recent news has also spread the flames of rumors surrounding the potential for relocation. Court documents released in January have shown that the current ownership group has been hunting for potential investors and part-owners unsuccessfully for the past six years. And, as recently reported on the NHL Network, the league is apparently getting involved in actively trying to get a new majority owner to buy the team in the next 6-8 weeks, indicating that, if a new ownership group is not found in that time frame, they might be willing to open the door for relocation talks to other cities. While the NHL obviously does not want to give up on the ninth largest market in the United States, they also appear to not want to repeat the mistakes they’ve made (and are currently making) in Phoenix with the Coyotes. The Thrashers are already hemorrhaging money and facing a distinct disinterest from local sports fans, almost a mirror image of what has already been happening in Arizona, and the league apparently does not want to be stuck holding the tab for yet another southern white elephant. This, of course, has fed the flames of one of Canada’s favorite pastimes over the past decade, speculating over potentially adding another team up north. Centered mostly around Winnipeg and Quebec City, both of which lost NHL franchises in the 1990’s, hopes for new Canadian teams have been fiercely stoked over the past couple years. Most recently, hundreds of Quebec City residents traveled south to Long Island to attend a game between two of the most oft-discussed relocation candidates, the New York Islanders and the Thrashers. Former-Nordiques fans rallied throughout the game to get their support for relocation heard by both teams, much to the resentment of Islanders fans in the arena. Additionally, a primary reason for both Winnipeg and Quebec City losing their franchises in the first place, not having available up-to-date arenas, has mostly been solved in both municipalities, as Winnipeg already has the ultra-modern, though smallish, MTS Centre, and Quebec City recently approved partial municipal funding for an NHL-caliber arena, which is currently in the process of being designed. Given the very short time table for both teams, we can definitely expect to hear much more on this in the coming days and weeks. If you asked me to rank which one was more likely, I would have to go and say that the Kings relocating is definitely the more probable option, given the NBA’s already shown willingness to allow teams to relocate over stadium issues versus the NHL’s fierce defense of unprofitable teams. However, if the rumors about the NHL not wanting to face another Phoenix situation are true, then the impetus to search for an ownership group to move the team elsewhere could very have have legs of its own as well. I read an online Examiner Atlanta article talking about the possibilities the Thrasher may relocate to Winnipeg or Quebec City. The writer did a good job by delving into the legal jargon of the Thrashers’ status as an expansion team into the NHL. According to the author, amongst other things, the Thrash wouldn’t be able to leave Atlanta until around its 15 season (1999/2000-2015) because the league put in a safety mechanism to protect the team from this very same problem. If a Canadian Owner decided to swoop in and make a purchase they would have to deal with the possibility of more financial losses until the contract clause ends. Interesting, I’ll have to keep an eye open on this league safety mechanism as the story progresses. Obviously, the discussion about the NHL trying to find new owners for the team are mostly just rumors, but if they’re true then the legal clause you mentioned would definitely be a hamper on their selling ability unless the league can void it.